Sometimes the most powerful resource you could ever have in a game is information. Knowing what your opponent has and what you have in turn can take a lot of the guesswork out of what moves to make. Thus investigations are IMPORTANT!! Looker’s Investigation is a Supporter that lets you first look at your opponent’s hand, then you can decide whether to shuffle your hand or their hand back into the deck and draw 5 new cards. This card has a lot of great utility in and of itself, letting you figure out what your opponent already has and deciding on whether you should draw some new cards to help counteract it or throw their hand back and force them into a fresh new start. It’s a pretty good card in that it’s versatile like that, definitely a good plus in general. You wouldn’t want to use it on your opponent if they’ve got less than 5 cards though, just so they don’t benefit from getting cards they could then use against you, just as much as you might not want to use it when you’ve got useful cards in your hand. Sometimes you’ll get stuck in that position though where both cases are true, in which case you have a decision to make: do you shuffle your opponent’s hand back to keep your own, or do you put your stuff back so your opponent doesn’t get to draw new cards? Arora Notealus: Looker’s Investigation is pretty solid overall, and I’d love to see another card like it to come out in the modern game. It could be a great tool to have to say the least, and it invites some skillful play through decision-making. I always like the idea of having a card that can fulfill these kinds of purposes, promoting thoughtful play like that in a simplistic manner. A little less automatic than “Draw 6-7 cards”. Looker’s Investigation (Platinum 109/127) is the subject for this week’s Throwback Thursdays, after we just looked at a two-fer of Looker and Looker’s Whistle. This card was reviewed by the crew on February 9, 2009 (https://www.pojo.com/COTD/2009/Feb/9.shtml). The reviews were very favorable, and by looking at his effect, you’ll be able to see why. 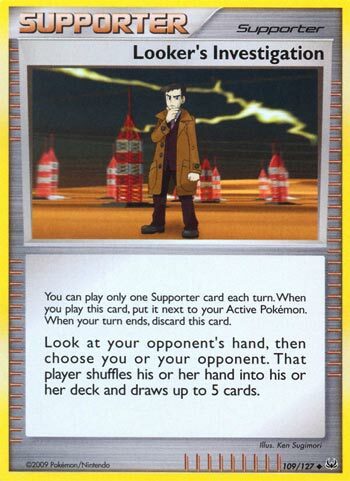 Looker’s Investigation is one of those cards that I would love to see in modern times. Granted, we did have an opportunity between February 2009 to July 2011, where it got axed due to early rotation. Psychic’s Third Eye comes close (like looking at your opponent’s hand), but that card didn’t see as much play (doesn’t disrupt your opponent and the method of drawing cards is costly). What Looker’s Investigation does is you get to look at your opponent’s hand. Then you can choose either yourself or your opponent, and you/that player will shuffle their hand into their deck and draw 5 cards. This is useful such that you shuffle away your hand because your hand is full of cards that you can’t make use of at the moment. It is also helpful because by looking at your opponent’s hand, you can determine if their current hand is a threat for their next turn, and you can shuffle away their key cards/combos. However, as with RNG, you opponent may get a better hand even after being disrupted, rendering from disruption to naught. Or you may get a bad hand even after shuffling previous bad cards back to your deck. This card came out when I haven’t played the Pokémon TCG at all until June 2010, so I don’t recall how well Looker’s Investigation did. I do recall seeing another shuffle-based supporter such as Cynthia’s Feelings (because I physically bought DP Stormfront’s Theme Decks: Raging Sea and Dark Rampage). She might rival Looker’s Investigation such that she may net 8 cards if one of your Pokemon has been KOed during your opponent’s last turn. If not, then she nets four cards. Looker’s Investigation was a guaranteed five. Looking at two of those World Championship decks that used Looker’s Investigation, it was seen on QueenGar and Boltevoir. Not as part of those deck’s strategy, but as a solid shuffle-based draw Supporter. And all the other Supporters and Item cards that they have were search related cards like Roseanne’s Research, Luxury Ball, etc. Boltevoir even have two copies of Judge as another shuffle-based draw and disruption. Not much for me to say here in the past, so let’s hypothetically pretend that this card was reprinted. Looker’s Investigation would still be a great card, just either use over them or being crowded out by competition by Cynthia and N. Looker’s Investigation does edge out a little between the two, doing a bit more stuff than Cynthia and more utility than N like being able to look at your opponent’s hand when N couldn’t without the aid of other trainer cards or Pokemon. And in Limited, whose Platinum prerelease is long gone, this is a must run unless you also have plenty of search related Supporter cards. Notes: I actually still have one copy of Looker’s Investigation in my DPPT binder, and I might consider using it for casual play……if I got the deck space for it. The worst experience for me in unlimited would be the using a lot of time thinking which broken cards I would put in. There’s just far too many options in that card pool to consider. Looker’s Investigation (Platinum 109/127), a card that released eight years ago. This Supporter has you look at your opponent’s hand, then make a choice: either shuffle your hand into your deck and draw five cards OR have your opponent shuffle his or her hand into his or her deck and draw five cards. In short, this card is a SUPERIOR version of Professor Oak’s Research or Shauna, both of which are Supporter cards that allow you to shuffle your hand into your deck and then draw five cards. A five card draw after shuffling your hand away is a little bit lacking when you’re burning a Supporter to do it for yourself, but a little too generous when you’re trying to disrupt your opponent. Unlike most disruption, this gives you a chance to see your opponent’s hand, to avoid accidentally helping him or her out. Unlike Ghetsis, N, or Judge, you don’t get any draw for yourself while attempting to disrupt your opponent, which is usually a bad thing. A year after this card’s release, Professor Oak’s New Theory raised the bar for vanilla shuffle-and-draw Supporters to six cards instead of five, and Cynthia means the same standard applies in Standard (and Expanded). I cannot remember how much it was used historically; looking at the World Championship Theme Decks that are released based on high performing decks from the previous year’s actual World Championship, the winner of the Juniors Division in 2009 and the Runner-Up for the Masters Division used the card. Were Looker’s Investigation re-released, I am afraid it wouldn’t fare all that well; it would be a nice option to have for the format, especially as we don’t have a lot of cards that actually force your opponent to draw, but I believe we need a slightly more potent “bonus” than just being able to choose which player shuffles-and-draws five cards to justify settling for less than the shuffle-and-draw six of N (when you haven’t taken any Prizes) or Cynthia, or the shuffle-and-draw four for BOTH players when using Judge. As is, I’d still like Looker’s Investigation back; at the very least, it’d be great in the Limited Format (and the Theme Format, should it show up in a modern Theme Deck). I’m going to indulge myself by suggesting a small-but-significant change that I think would make a Looker’s Investigation reprint (or new card inspired by it) fit quite well into the current format. There is a tiny chance that Looker’s Investigation can backfire, as you find you want both players to keep their current hands after seeing what your opponent has in store for you, and there is a good chance you’ll wish you could have both players shuffle their hands away and draw five new cards. So… what if those two options were added to Looker’s Investigation? I don’t think such a thing will happen, of course.